We're told to respect our elders. The game we're reviewing today takes that wisdom seriously. Nusfjord finds players trying to grow their fleets to be the best in the cold land. So is Nusfjord a delicious chowder of a game? Or is it a stinking pile of dead fish? Let's find out! Take the Action board and place it on the appropriate side based on the number of players. Place the Banquet Table board to the left of the Action board, next to the Serve Fish space, and then place fish on the plates, depending on the number of players. Place the Ships and Elder board out, and then put the Elder cards on their spaces, again depending on the number of players. Place the two Building boards to the right of the Action board. You’ll pick one of the three available Building decks to play with, and fill in the Building boards with 9 random A Buildings from your chosen deck, and 6 random B Buildings. 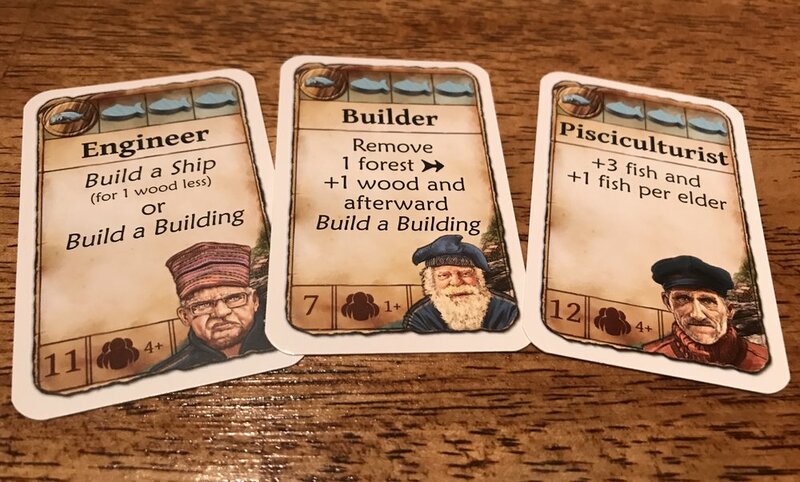 Now each player takes a Harbor board, an Elder Council board, the three Workers in their color, the five Shares, and the Personal Supply board. Turn two Shares faceup, and three facedown. 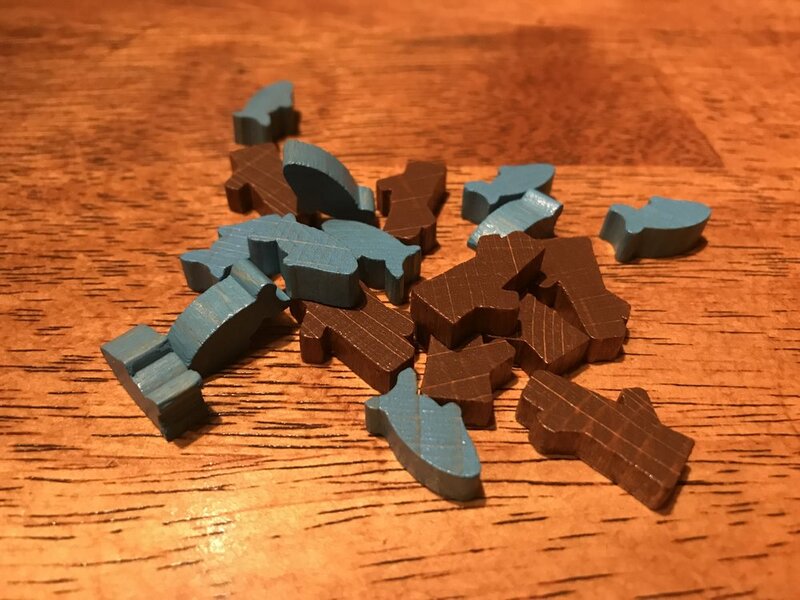 Each player covers the Building spaces on the right side of his Harbor board with four Forests. Then gather the appropriate First Player tiles for the number of players, choose a first player, and distribute them accordingly. The first thing that happens on each turn is that everyone goes fishing. Based on the number of boats in your fleet, you’ll get a certain number of fish. Then you have to divvy up your catch. First, any Elders in your Elder Council get one fish each. Then you pay one fish to each of your Shares in someone else’s possession. Then you pay one fish to each of your own issued Shares in your possession. Any remaining fish are put into your Reserve—but your Reserve can only hold 8 fish. Any your Reserves can’t hold go back to the general supply. Next is the Work Phase, where everyone goes around, from the first player clockwise, and takes one action. Each person has 3 Workers, so you’ll get to do three things in each of the 7 Rounds. Here are the spaces you can choose from. +1 Gold: Take a gold. Transfer Reserve: Take any goods from your Reserve and move them to your Personal Supply board. Serve Fish: Place fish onto empty plates, starting with the rightmost empty and moving left. Each plate costs an increasing number of fish to fill. You’ll use these fish later when you want to get Elders. Build a Building: Pay for any Building card and place it onto a free space on your Harbor board. Buildings have different powers, some of which are one-time, some of which are ongoing throughout the game, and each of which has end-game VPs. Issue a Share: Take one of your facedown unissued Shares and place it faceup on the Newly Issued Shares space of the Action board. Then take 2 gold from the supply. Buy All Shares: Pay 1 gold for each Share on the Newly Issued Shares space, and take them all in front of you. It doesn’t matter if the Shares are yours, or another player’s, you get them all. You have to buy all Shares there, so if you don’t have enough money to buy them all, you can’t go to that space. 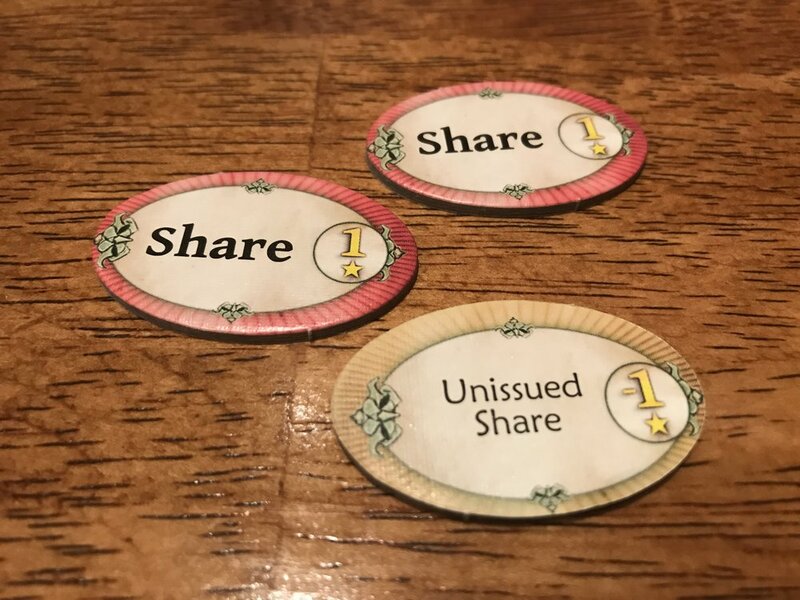 Also, as the game progresses, the Shares get cheaper to buy, because their usefulness decreases. Deforest: Remove one Forest from your Harbor board, and get 5 wood to your personal supply. Thin Out: Take an amount of wood equal to the number of Forests on your Harbor board. Reforest: Take two Forests from the supply and place them both, stacked on top of each other, over two free spaces on your Harbor board. Build a Ship: Pay for a ship, and place it into your fleet, as far to the left as possible. Take an Elder: Take one of the available Elders and place it on your Elder Council board. You can only do this if there’s a fish available on the Banquet Table board. In addition, if there’s another fish on the Table, you can immediately take the action on that Elder, without using a Worker. If there are no fish on the Table, you can’t take an Elder. Use an Elder: You are the only one who can use your Elders. In subsequent turns, you can place a Worker on your Elder and take that action. Again, you can only do this if there are fish on the Table. At the end of the round, everyone gathers their Workers from the action spaces, and the First Player token rotates. Depending on the number of players and the round, you might add more Building cards to the Building board, or other actions. After 7 rounds, the game ends. Count up the VPs on your Buildings and Ships. You get 1 VP for each Share in front of you—whether it’s yours or an opponent’s—and you get 1 VP for each gold you have. Subtract 1 VP for each of your unissued Shares, and for each uncovered space on your Harbor board (without a Forest or a Building). Variant: We always play with a variant. Players are supposed to get their three C-level Building cards at the start of the 4th Round, and then any they don’t build that Round get put into the general supply at the start of the 5th Round for anyone to build. That’s TERRIBLE. 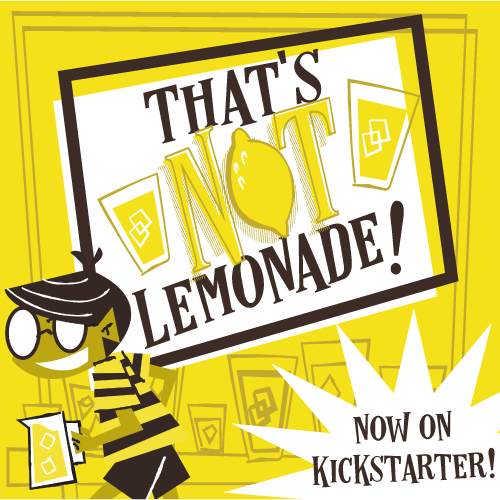 We play with a variant where everyone gets their three C-level cards at the beginning of the game. Players still can’t build them until the 4th Round, but now they have a chance to actually plan for them, rather than be surprised by them, and have no planning time. I would recommend playing with this variant from your very first game. I think Nusfjord is great. I love the variability of the Buildings. I like the distribution of the fish at the beginning, and the tension of having to balance your Reserve and how to get those Reserve goods to your personal supply. The Elders are a great mechanism, and the fish economy is very interesting. Everything is connected, and I like how it all works together. Money is super tight, so you’re constantly feeling pressure to Serve Fish, or issue a share, but both of those can potentially help other players, too, so timing is everything. It’s a delicious tension. I’ve played Nusfjord with all player counts, and with different decks, and it all works. The 5-player game does take a little long, and it wouldn’t be my first choice of player count, but it still played well. I’ve also played numerous games with my 10-year-old, and it’s one of his current favorite games. One of the biggest upsides for me is that Nusfjord plays in half the time of Uwe’s big games, such as Ora et Labora or Caverna. It’s not as good as Caverna, but I don’t often have time to play Caverna, so Nusfjord gets played more often. 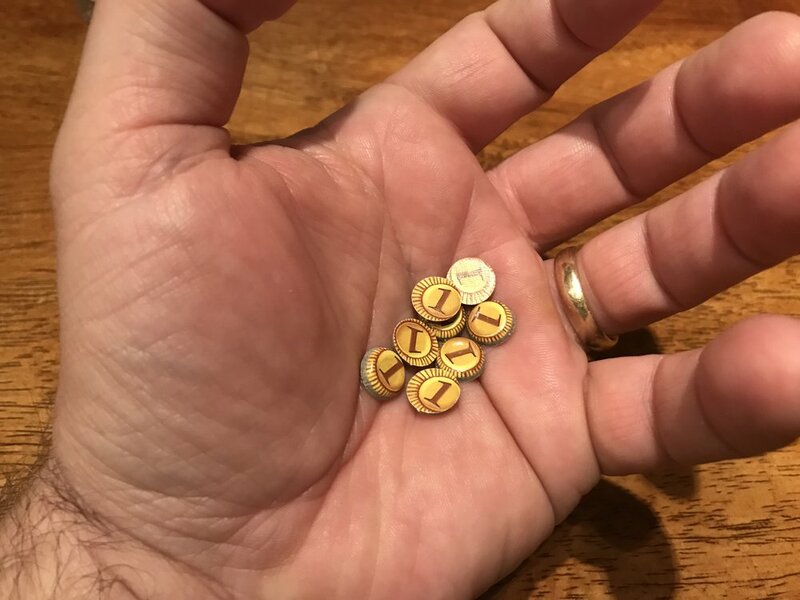 My one complaint seems like a goofy one: The $1 coins are RIDICULOUSLY small. But seriously, they’re so difficult to pick up. I’ve heard that the announced expansion will have metal coins—it’ll be worth getting for the coins alone. Firestone’s Final Verdict—This is a tight worker-placement game full of interesting decisions, lots of variability, and plenty of player interaction—all wrapped up in a short playing time. It’s an underrated gem. Thanks for reading! 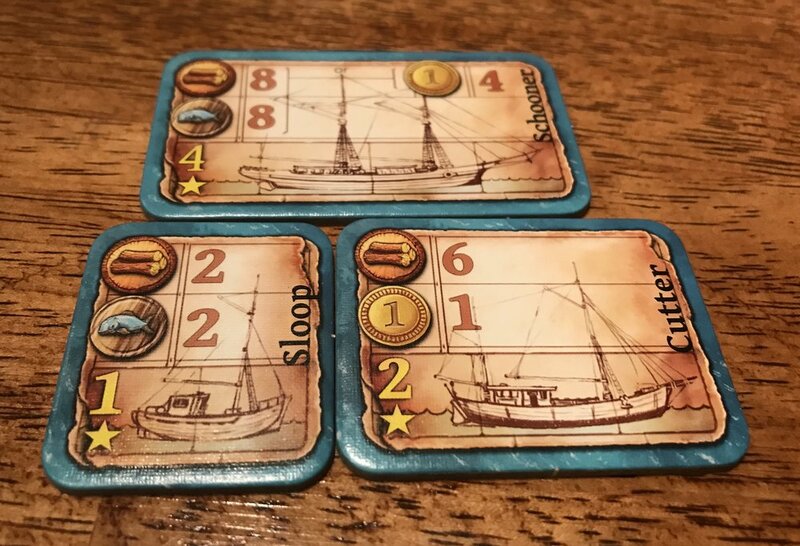 Have you played Nusfjord? Let us know your thoughts in the comments.